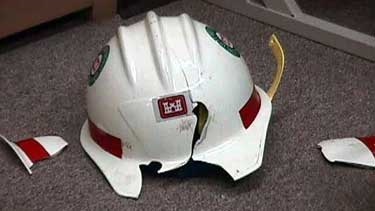 The remains of Richard Duck's shattered hard-hat indicate the force of the blow that it absorbed. Just as common as the castle image, are hard-hats in the U.S. Army Corps of Engineers. Most people probably consider those plastic helmets are probably just part of the scenery. But for one power plant mechanic who fell more than 20 feet from an unprotected ledge at the Dardanelle Powerhouse, a hard-hat made a difference. Although hard-hats are not designed to protect against lateral blows, this one did and prevented serious injury or death. The accident also led to improved fall protection at the Dardanelle Powerhouse. Richard Duck was working with James Nearn, the power plant senior mechanic, and Dino Cossey, a contractor with Voith Hydro, to find a leaky pipe in the Unit 2 turbine pit. The three had examined the pipe just outside the turbine pit, but didn't find any problems. Duck volunteered to go into the turbine pit area to look at the other end of the pipe for the leak. Turbine Pit: In order to reach the pipe, Duck entered the turbine pit through a door on the opposite side from the pipe. He climbed up a small, two-rung ladder at the entrance to get to the generator apron. Duck had to walk along this apron ledge to get to the pipes. The ledge is only four feet wide, and only four-and-a-half feet of head-room. Being that he is six feet tall, Duck had to bend to walk along the ledge. He got to the middle of the generator apron, then hit his hard-hat against one of the reinforcement ribs on the ceiling of the apron. The blow knocked his hard-hat over his eyes, and he became disoriented and lost his balance. "Before I realized it, I was over the edge," Duck said. "I tried to grab hold of something, but I couldn't. I thought to myself, 'Well, this is a done deal!'" Duck fell over the ledge and landed between the steel wicket gate arms 20 feet below. During the fall, Duck lost his hard-hat, but he kept it on long enough to prevent serious injury. He received a gash on his forehead, but the front and the back of the hard-hat were shattered. He also received bruises and a cut to his right palm. Cossey was still working outside the turbine pit when he heard a bang and went to investigate. When he entered the turbine pit, Cossey could see Duck's hard-hat broken on the floor. Then he saw Duck between the wicket gate arms. Cossey yelled for Nearn to get assistance, and stayed with Duck. Troy Tate, a power plant mechanic and paramedic, administered first aid while waiting for the Yell County Emergency Medical Service. The ambulance transported Duck to Saint Mary's Hospital in Russellville. He is now resting at home and undergoing physical therapy, and he is expected to return to work. Clarinda Harvey, industrial hygienist with the Little Rock District Safety Office, said "The hard-hat saved his life," "Duck, at some point during the accident, received a major blow to the front of his head. The hard-hat, held on momentarily by the earmuffs, took the force of the blow before it shattered." Lessons: What were the two direct causes of the accident? First, improper access to the site, and second the lack of fall protection. "Risk assessment and risk management are two principles that the Corps of Engineers is emphasizing these days," according to Brian Becker, a safety engineer in the Headquarters Safety and Occupational Health Office. "Mr. Duck was entering a cramped area with a narrow ledge, a long drop-off, and no fall protection. We all need to take a step back whenever we come up against something that looks risky, and think about the smartest direction to take." Solutions: After this accident happened, the Little Rock District took immediate steps to install temporary safety measures, and they are working on a permanent safety solution. The first and immediate solution was to install a tie-off cable around the perimeter of the concrete ledge so workers can use fall protection while they work. Then they started a research, with specifications and drawings that were completed in short order, and then information was faxed to five prospective bidders on Aug. 5, with a request for their responses no later than Aug. 21. The urgency of the situation to staff in Contracting Division, was explained by the project office and an information packet with the bidder responses was forwarded. "Contracting promptly responded by reviewing and awarding the contract as soon as possible," said Bob Coke, a civil engineer with Russellville's Navigation Branch. The Industrial Safety Source began installing the lifeline systems on Sept. 18, and completed the job three days later. They also provided training in the use and maintenance of the equipment. Protecta International designed the lifeline system. It runs the circumference of the wall behind the generator bearing beam apron and is designed to provide fall protection for two employees working together in the area. The contractor provided shuttles (sliders that move back and forth on the cable) with this system, and that allows workers to tie off and still move freely around the area without having to unclip and re-clip to move from area to area," Coke said. Southwestern Division's safety officer has suggested that a copy of the specifications for the fall protection be shared with other districts and used where needed. The district's Engineering and Construction Division also is working on a permanent engineering solution to make the area safer. This will probably include installing grating over the openings around the perimeter of the ledge. A design is planned for fiscal year 2001.